The suspicion alone of a lung cancer diagnosis is stressful and overwhelming. Being sent for a biopsy brings up many thoughts and emotions. Understandably, "Will my tissue be tested for biomarkers?" usually isn't one of those thoughts. That's why the American Lung Association has launched a new awareness campaign, called "Tell a Friend about Tumor Testing." Sharing this important information can mean new hope and additional treatment options for a friend with lung cancer. In the recent past, lung cancer was considered one disease, and most patients who weren't eligible for surgery received general chemotherapy as treatment. However, in more recent years, scientists have made discoveries that have vastly changed the lung cancer treatment playbook. They discovered that some people have certain mutations or biomarkers in their tumor that provide insight into what is causing that tumor to grow. Therapies have been developed that "target" these biomarkers and help stop or slow tumor growth. These targeted therapies are more precise, effective and often have fewer side effects. When doctors know the makeup of a tumor they are much better equipped to suggest a treatment plan specific to the patient, rather than using a "one size fits all" approach. Let's take LUNG FORCE Hero, Lisa M., for example. She appears with LUNG FORCE Hero, Jennifer N. and pathologist Dr. Mark Pool in a new video about tumor testing. At the age of 44, Lisa was diagnosed with stage-four lung cancer. Luckily, her doctors sent her lung tissue to be tested for biomarkers. The tests revealed she had an EGFR mutation and was able to go on a targeted therapy. Lisa responded very well to her therapy and now has no evidence of disease. Lisa was fortunate that her doctors tested her tumor, but not all patients with non-small cell lung cancer (the type most likely to have biomarkers) receive this testing. Often large research hospitals do tumor testing automatically, but smaller community hospitals may not. When you consider that an estimated 80 percent of people receive care at a community hospital, this is alarming. Raising awareness of tumor testing, through efforts like "Tell a Friend," can bring new hope of these innovative treatments to these patients. Patients not only need to be more aware of tumor testing, but also need to talk to their doctors to better understand the testing options. For example, not all biomarker tests are created equal. Some tests only look for a few select mutations like EGFR, ALK and ROS-1. Ideally, tumors are tested with a comprehensive genomic testing panel, which gives a fuller picture of the makeup of a person's tumor. This type of testing may capture mutations that do not yet have an approved therapy, but are being studied in clinical trial. An expanded test panel can also include testing for PD-L1, which gives pertinent information about how someone may respond to immunotherapy, which harnesses a person's immune system to fight the cancer. Timing also matters. In order to perform this test, pathologists need a certain amount of lung tumor tissue. If enough isn't taken out during the initial biopsy, patients may need a second biopsy, which can be risky. That's why it is important to have conversations with your doctor about tumor testing as soon as possible. There have been advancements in liquid biopsies (a simple blood draw). They are not quite as accurate as tissue biopsies, but can find several types of mutations. 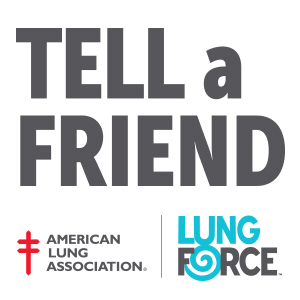 Through our "Tell a Friend about Tumor Testing" campaign, the Lung Association will raise awareness about the importance of comprehensive genomic tumor testing, and improve lung cancer patient's access to the treatment option that is right for them. This campaign harnesses the voices of LUNG FORCE Heroes like Lisa, whose treatment options were impacted after tumor testing. Help us spread the word so that all lung cancer patients have access to the highest quality care by sharing our video on social media. And, if you have a friend who is facing a lung cancer diagnosis - be a friend, and tell them about tumor testing.